LG: Learn about the ancient African cultures. LG: Learn about the early cultures of the Americas. LG: Learn about the early explorers of the Americas, and early cultures. LG: Learn about the early cultures of the Americas, and the people who came to conquer the new world and their motivations. LG: Learn about the early cultures of the Americas, and how they interacted with the Old World. LG: Demonstrate knowledge of Early African and American cultures, and the explorers of the New World. Learn about the middle ages, also known as the dark ages. Textbook-Familiarization with terms regarding International Trade. Also use Crash Course Economics # 2, 15, & 16 if you need help. Small groups and lecture over costs and benefits of free trade. Entitle following-Free Trade Articles-For Each Article write down 3 major points and if you agree or disagree with each article overall as well as why. After reading all articles write a 100 word summary of what you think about the new trade deal overall. Should Congress pass it? Complete USATestPrep assignment for International. Due before class tomorrow. 80% minimum score. Make up following department calendar if you missed. D.R.-Ch 10-Career Choice and Taxes. Fiscal Policy. Watch crash course over this topic. Go to the Macro Practice. Must get a minimum of 90%. Have done before class Thursday. When you’re done try to balance the budget. This is an example of fiscal policy at work. When done with this fill out this form on it. Quick video on CPI if you need it. NE Quiz over Ch 11. Position piece on debate topic. Present your topics and the macro arguments. 1. What is the Federal Reserve? 2. Describe each of the tools in it’s toolkit to influence the economy. 3. Say they wanted to speed the economy up, what would they do with each of the tools. When you’re done, play the Chair the Fed game. Record how you finished and what the challenges were. Did you win? Inflation & Deflation in the Wizard of Oz. Stossel on Taxes. If absent take 25 notes on this and email to me. The Federal Reserve and Who Owns It? What did you cut? Why did you make these decisions. Study Ch 14-16 Chapter reviews for tomorrow. Reviewed shifting of demand and supply. Monetary supply section review completed. Wizard of Oz & Money supply. LG: Learn about the Constantinople. For Module 10 answer all questions for each of the lessons throughout the chapter. Pgs-356, 363, 373, 380, 387. Turn in Wednesday. 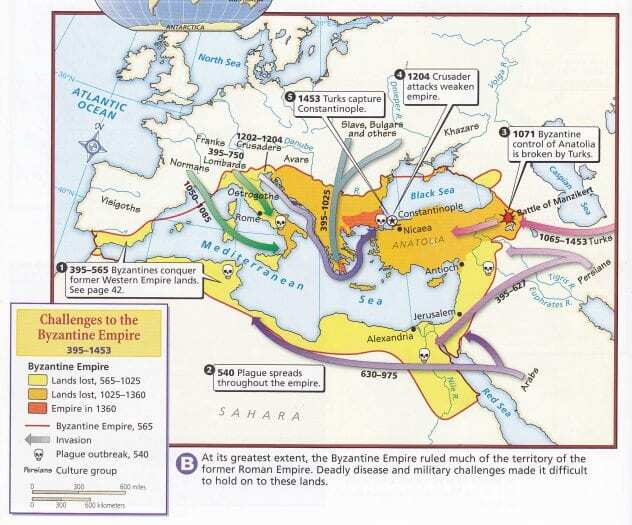 LG: Learn about the Byzantine Empire. LG: Learn about how Russia developed. LG: Learn about the Mongols and their rise to power. New Empires Emerge Review Guide-Due next Friday. Islamic Cultural Achievements-Read and prepare for quiz. LG: Compare Islam, Judaism, and Christianity. LG: Demonstrate knowledge of the Byzantine, Russian and Islamic Empires. Review for test over Byzantine, Russian and Islamic Empires. Test- Byzantine, Russian and Islamic Empires. Viewed Crash Course-Productivity and discussed. Answer the questions on 335. Define all terms for pgs. 336-343. Define all terms for 375-381. Use online textbook and turn in Monday if you were absent. Get packet from back table. (This is is just the articles on the blog above under Wednesday. Summarize on a separate sheet each of the 8 Reasons Rome Fell. A couple sentences a reason is fine. Skip to the last article. Summarize info under each heading. Read the middle article Is This Our Moment of Decline? Identify 3 things we have in common with Rome during it’s fall and 3 things you think we do or could do differently. Write a 100 word or more answer to the question Is This Our Moment of Decline? for our country. Support your reasons. Fall of Rome essay due through Turn it in before class on Friday. Trivia game in class to review. school- kids just log into a computer and click link. password: whatever their school password is. You will have to scroll down to the World History Book. Turn in before you leave. Use online textbook to complete tonight. Online login instructions are on my blog.